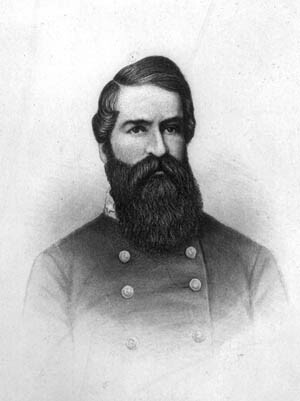 Turner Ashby’s career as a Confederate cavalier was short but memorable. He almost fought a duel with Stonewall Jackson. Even in an army not lacking for larger-than-life figures, Confederate cavalry leader Turner Ashby stood out from the crowd. Although not particularly tall—about five feet, 10 inches—there was something about Ashby that commanded attention. Maybe it was his dark, bushy beard, or his equally dark, ever-darting eyes. Whatever it was, people noticed Ashby. “His face was the kind that cannot be photographed,” said his friend, Lieutenant Henry Kyd Douglas. “Riding his black stallion, he looked like a knight of the olden time, galloping over the field on his favorite war horse.” Ashby augmented his style with a battle costume that included spyglass, gauntlets, and fox-hunting horn—all the accoutrements of a Virginia-born gentleman. As cavalry chief for the legendary Thomas “Stonewall” Jackson, Ashby naturally took on some of the glamour surrounding the South’s most-vaunted warrior. Like others around Jackson, Ashby grew in stature from his close proximity to the famous Stonewall, even if the two did not always see eye to eye. The religious, liquor-abjuring Jackson frequently had to look the other way when Ashby and his looting, carousing horsemen in the 7th Virginia passed by. If Jackson thought he was merely disciplining Ashby, he was wrong. The hard-riding horsemen in his command immediately let it be known that if their longtime leader left the army, they would leave with him. It was a tribute to Ashby’s personal charisma that the notably fractious Southern cavalrymen refused to serve under anyone else. It was well-considered advice, but Ashby—as usual—did not heed it. Instead, on the afternoon of June 6, 1862, while leading a counterattack during an insignificant skirmish with Union cavalry outside Harrisonburg, Virginia, Ashby had his horse shot from under him. Dismounting, he was waving his sword and calling for his men to follow him when he was fatally struck by a bullet that passed through his right forearm and pierced his heart, killing him almost instantly. Jackson might almost have been describing himself. Tags 7th virginia cavalry, Confederacy, First Battle of Kernstown, Stonewall Jackson.